The objective of this study was to evaluate the toxicity of sediments from the Grand Calumet River and Indiana Harbor Canal located in northwestern Indiana, USA. Toxicity tests used in this assessment included 10-day sediment exposures with the amphipod Hyalella azteca, 31-day sediment exposures with the oligochaete Lumbriculus variegatus, and the Microtox® Solid-Phase Sediment Toxicity Test. A total of 30 sampling stations were selected in locations that had limited historic matching toxicity and chemistry data. Toxic effects on amphipod survival were observed in 60% of the samples from the assessment area. Results of a toxicity test with oligochaetes indicated that sediments from the assessment area were too toxic to be used in proposed bioaccumulation testing. Measurement of amphipod length after the 10-day exposures did not provide useful information beyond that provided by the survival endpoint. 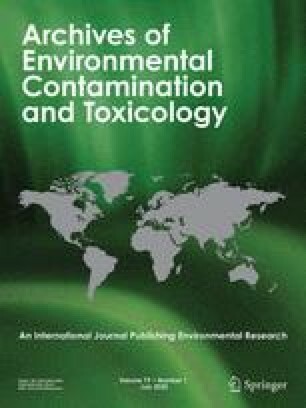 Seven of the 15 samples that were identified as toxic in the amphipod tests were not identified as toxic in the Microtox test, indicating that the 10-day H. azteca test was more sensitive than the Microtox test. Samples that were toxic tended to have the highest concentrations of metals, polycyclic aromatic hydrocarbons (PAHs), and polychlorinated biphenyls (PCBs). The toxic samples often had an excess of simultaneously extracted metals (SEM) relative to acid volatile sulfide (AVS) and had multiple exceedances of probable effect concentrations (PECs). Metals may have contributed to the toxicity of samples that had both an excess molar concentration of SEM relative to AVS and elevated concentrations of metals in pore water. However, of the samples that had an excess of SEM relative to AVS, only 38% of these samples had elevated concentration of metals in pore water. The lack of correspondence between SEM-AVS and pore water metals indicates that there are variables in addition to AVS controlling the concentrations of metals in pore water. A mean PEC quotient of 3.4 (based on concentrations of metals, PAHs, and PCBs) was exceeded in 33% of the sediment samples and a mean quotient of 0.63 was exceeded in 70% of the thirty sediment samples from the assessment area. A 50% incidence of toxicity has been previously reported in a database for sediment tests with H. azteca at a mean quotient of 3.4 in 10-day exposures and at a mean quotient of 0.63 in 28-day exposures. Among the Indiana Harbor samples, most of the samples with a mean PEC quotient above 0.63 (i.e., 15 of 21; 71%) and above 3.4 (i.e., 10 of 10; 100%) were toxic to amphipods. Results of this study and previous studies demonstrate that sediments from this assessment area are among the most contaminated and toxic that have ever been reported.